Why is it so hard for managers to get the results they want? According to the latest brain science, it's because most of what they do produces the opposite of what they expect. Appeals to reason fall short, for our decisions are made emotionally, and logic is at best an after-the-fact justification for what we've already determined to do. That's just one of the many amazing discoveries that explain why management is so challenging. but as Charles Jacobs explains, once we understand the lessons of neuroscience, we're able to create more powerful strategies, inspire people to maximize their potential, and overcome the biggest hurdle to improving business performance-making change stick. Charles S. Jacobs is an author, public speaker, and the founder of 180 Partners, which is dedicated to improving businesses through application of the latest psychological science. His clients include 50 of the Fortune 100 and are spread across four continents. 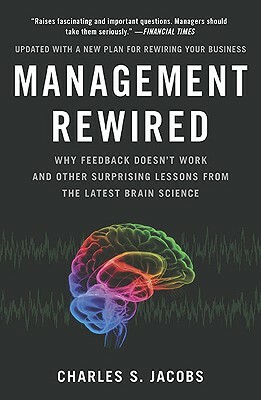 He is the author of Management Rewired: Why Feedback Doesn’t Work and Other Surprising Lessons from the Latest Brain Science.